An attractive, evergreen shrub, this New Zealand myrtle has striking, colourful foliage that can't fail to impress. Easy-to-grow, fully winter hardy and is also perfect for a large pot on the patio. Small, scented white flowers are produced in summer on mature plants. Ultimate height and spread H 1.5m (5ft) x 1.2m (4ft) in 5 years. With its dense habit and distinctive, deeply-coloured foliage, Lophomyrtus 'Red Dragon' is a superb addition to your garden - use it for hedging, as a border, or as a low maintenance specimen plant. An attractive evergreen shrub, this New Zealand myrtle has striking, colourful foliage that can't fail to impress. A great all-round ornamental plant, its small leaves are olive-green when young, maturing to deep red/purple. 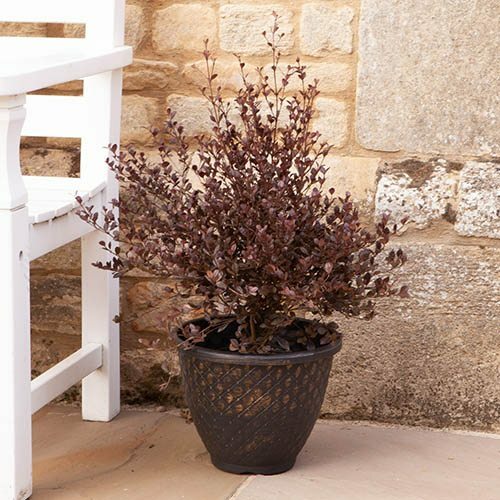 Ideal for a sheltered spot in sun or partial shade in your garden, Lophomyrtus is easy-to-grow, fully winter hardy and is also perfect for a large pot on the patio as a feature plant. If you're looking for something a little different for your garden, then you'll find Lophomyrtus is a good choice - the small leaves of this beauty make it a particularly good candidate for cloud pruning or low hedging. You also get an added bonus - when mature, 'Red Dragon' produces small white flowers with a delicate scent from early summer. Ultimate height and spread H 1.5m (5ft) in 5 years x 1.2m (4ft) you will receive an established plant in a 3L pot. The small leaves of Lophomyrtus make it ideal as a topiary specimen for a dramatic effect. Plant ensuring that the top of the root ball is level with the soil. Remove dead, diseased or misplaced branches in late winter or early spring, otherwise very easy to grow. If grown as hedging, prune in spring and mid summer - Lophomyrtus is tolerant of severe pruning. Fully hardy, but offer winter protection in cold or exposed positions and avoid overwatering during the colder months.